Is Kim Kardashian and Kanye West’s marriage already over? Tabloid reports claim the Kimye relationship is heading for divorce after just 58 days, but other sources maintain this is not true. The latest reports about a Kim Kardashian and Kanye West divorce came after a cover story insisted West had abandoned his wife after less than two months of marriage. The tabloid claimed Kardashian is mad about West’s behavior but does not want to go through the drama of another divorce. However, an insider told Gossip Cop that this latest Kimye divorce rumor is “false.” But while Kim Kardashian and Kanye West are not splitting up just yet, it certainly sounds like there is already trouble in this marriage. Earlier this month, reports swirled that the two stars were fighting on their honeymoon. Kanye West and Kim Kardashian then supposedly tried a second honeymoon in Mexico. But this time West was reportedly miserable, as he hated just lounging by the pool all day. And the honeymoon is not the only reported source of tension between Kim Kardashian and Kanye West. Reports also claim the reality star feels her new husband is too controlling. So while Kim Kardashian and Kanye West are not yet ready to split up, we would not be surprised if the stars already regret getting married. 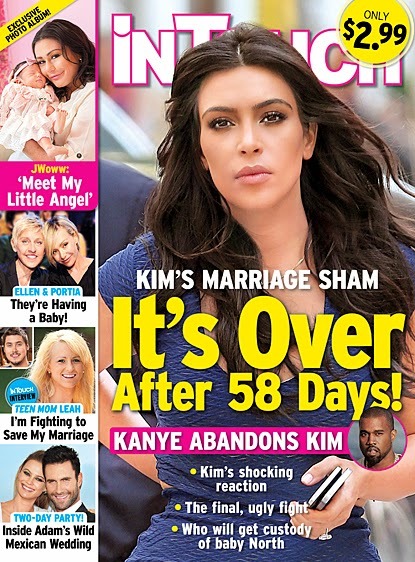 But we do agree with the theory that Kardashian will not want another marriage to end in divorce, especially so soon after her failed relationship with Kris Humphries. We think Kardashian will thus do whatever she can to save her marriage, even if that means getting pregnant again right away.